In 1954, Malcolm Taylor, a noted foreign-affairs journalist, kissed his daughter at the front door, said goodbye, and promised to come back. He didn't. In 1967, Kristin Taylor, a budding novice journalist, followed her father's trail to find out why. So begins a gritty and heart-rending tale of integrity, faith and perseverance in two war-torn countries: Vietnam and the United States. In Saigon, Kristin meets up—or rather, is forced into reluctant collaboration—with Luke Maddox, a photojournalist who irks Kristin in just about every way imaginable. And she reciprocates. Little do either of them know that Kristin's determination to follow through on a story her father had begun the previous decade and Luke's hidden past are intertwined. Finally, her self-imposed assignment, an exposé on a secret war within a war, threatens to explode both of their worlds, which have now become one. Professionally, Kristin excels in her honest portrayal of a conflict gone so wrong, endearing herself to the men she has come to respect and love. Personally, she doesn't do so well in shielding her emotions from the horror engulfing a nation she has also come to love. From the trauma of a blood-spattered field hospital, to the heat of battle at a forward fire base, to the precious and precarious existence of a Saigon orphanage, Kristin learns the hard way how to survive physically, mentally and emotionally in an environment man was never meant to endure. Her love-hate relationship with Luke comes to a head, then Kristin is forced to return to the States. Like most veterans of that conflict, part of her she leaves in Vietnam, part of Vietnam she brings home with her. And life is never again the same. Ms. West delivers an honest, compelling, and very well-written tale of war and the aftermath of war. But it's not a mere blood-and-guts story. It's one of hope. She shows us how love and faith have curious and unexpected ways of sprouting even in the most barren soil. Yesterday's Tomorrow will leave you very satisfied at its conclusion, but don't expect the path to be strewn with rose petals. Few paths to meaningful destinations are. As an endnote, Ms. West is represented by Rachelle Gardner of the Wordserve Literary Agency. Neither Ms. Gardner nor Wordserve are known for tolerating mediocrity. In Catherine West, and Yesterday's Tomorrow, they've advanced their excellent reputation. 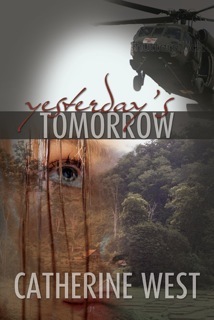 This is a review of an ARC of Yesterday's Tomorrow. The book is due to be released through online outlets in March 2010 by OakTara--another pretty good outfit, I might add.